Land Use Charge: NBA Ikeja to protest today – Royal Times of Nigeria. 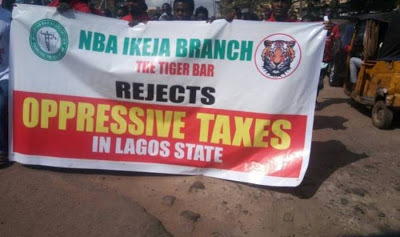 The Nigerian Bar Association (NBA), Ikeja Branch, has restated its resolve to embark on another round of protest today over the reviewed Lagos Land Use Charge. The NBA Chairman, Mr Adeshina Ogunlana, said at a media briefing on Wednesday that in spite of the reduction of the rates and levies under the Land Use Charge the protest would go on as planned. The NBA chairman said that the protest was a response to failure of the state government and State House of Assembly to meet their demands. Gov. Akinwunmi Ambode had earlier reduced the levies by 50 per cent following a protest that greeted the Land Use Charge, but the reduction did not go down well with some stakeholders who insisted the LUC returns to status quo. A public hearing on the Lagos Land Use Charge organised by the Lagos State House of Assembly on March 27 turned rowdy as Ogunlana led lawyers in a walk-out, insisting that the notice to submit their memorandum was too short.